The poles of a magnet require two streams of influence. One pushes one way and the other pushes the other way. We then create a field of influence which covers all sides of the whole bar, the entire formation of magnetic particles in a group. Add more magnets and the field grows, the polar extremities are pushed further and further out. In trends, niche culture and society in general, the extreme ends of a movement can be likened to these principles. Music is a big example, when one group releases one kind of sound, another group emerges to counter it, on the other side of the spectrum. Rockers and Mods perhaps were the first well publicised example of this phenomenon with the release of cult classic, Quadrophenia. In this way, each movement splits into its polar opposites. Royalists and Cavaliers in all their many walks of life spring up in their many flavours. Then still, the groups split off once more into their purist forms and their more dilute and tolerant ones. It happens with music, religion, clothing, and even diet and nutrition. 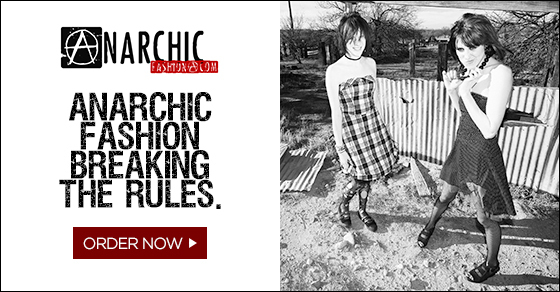 Anarchic Fashion Here - We are Breaking the rules. The push of one trend serves to fuel the growth of its extreme opposite, in many cases. As pop music became more commercial and homogeneous, alternative music began to diversify to compensate. The resulting army of rock, electro and world music groups to counteract the ever growing pop music industry have been required, much in the way of a tight rope walker's stick, to keep culture balanced and flowing in the directions required for holistic growth. We choose what we want. We pay for the things that end up back on the shelves next year, as well as the media throwing everything it has at us to make us buy their particular thing. For all the billions spent on promoting one artist, it can take a mere image or a mention from a friend to actually make a sale for a smaller product. This is how the alternative market grows, via mentions, underground media, and subconscious kudos for being brave enough to make an effort. The symbol of alternative culture is a trend on its own, and it speaks volumes about the mentality of the person who immerses themselves in it. We know that our thoughts about life matter a great deal to how w end up living it, and so when we allow modern culture to direct our vessel according to its wishes, what we choose to nourish ourselves with makes a big impact. This perhaps means that having a balanced and whole rounded approach to culture is a good and fair way to ensure we do not tip too far to one side, and permanently change our direction according to the perspectives of the media around us. One trend will ultimately push us in their direction, and the opposing trend in the opposite one, so if we can find a rounded taste for many of life's pleasures and activities, styles and ways of doing things, it can be fair that we get a positive and spirit nourishing experience in daily life. This of course is required for personal growth, mentally, physically, emotionally. Modern Artisans - unique home & garden decor handcrafted by skilled American artisans... Original art, pottery, wall decor, whimsical home accents, garden art, great gift ideas and more! Perhaps in this modern time, it is more difficult to make use of things as, in a disposable society, many items simply do not get made to sell for their hard wearing quality. With cheap magpie buys and flash fads which make the most out of the very least, it can be safe to say that on many of the things we buy now-a-days, there's very little left to upcycle. We really are headed down a path of trouble for future generations and have been for a long while, when the everyday person has neither the money or the experience and knowledge to make full use of the hard wearing nature of the best life has to offer, we will just carry on with the cheap option, and chucking it away when done. Maybe technology has served to propagate this, as we are experiencing exponential grown on all ides of the digital realm, and the analogue market has become something of a designer and luxury element of the high street. Recycling has valiantly stepped in during modern days once more, when we as a culture were confronted with footage and evidence of massive global desolation due to our our greedy needs. The disposable era is perhaps tailing away after-all if only we could shift some of our old habits. Many governments have taken steps to eliminate Throw Away Society, with pressure from public and professional groups. Taiwan being one fo the first to ban all disposable tableware, something which had been causing massive problems in the country for many years. Similar laws are being adopted all over the world in order to tackle the cheap, mass produced and easily disposable consumerism culture that has plagued the Earth since the onset of the industrial age. It isn't lazy, it is simply because we're not schooled in the art of thrift. This isn't penny scrimping like the word perhaps suggests, but making the most of things, pushing our daily useables to their maximum use potential. Replacing broken things with old pieces from other broken things has been a way of recycling for generations. In this very process, some of our biggest discoveries are found. If we don't play with materials and experiment with their capabilities, we would never find that they can perform specific functions. A magnetic compass perhaps is one of the first discoveries of this method, in which a magnetic strip would be found to point north when allowed to suspend from string or sit on a pivot. Making things from the same things they were before is a great thing, but for me it's wonderful to see things thrown out of their manufacturers comfort zone and used for some other purpose, quirky and aesthetically enchanting, curious oddities from different departments of life are always well received when placed in novel situations. Take a look at these creations, stocked in an antique shop not far from me. Click here to visit their site. With unbridled passion for the cut and the shape, tantalised fingertips have swished and trimmed, adapted and framed, to create some perfect apparatus for making women look gorgeous, glamorous and, as elegant as the morning chorus. Ten years of professional labours and loves culminate in today's high end product showcase website which generously offers international delivery and all duty paid with free returns. Truly a customer orientated brand, with the exclusive feel and look, the name Roland Mouret, sings clarity and class. The son of a butcher, the budding young designer was able to learn folding and cutting from the preparation of fresh meat. Moving into textiles, possibly in order to keep his hands clean, Roland Mouret went on to craft some of the most iconic pieces of clothing in the industry. The Galaxy Dress, a stand alone product, seeps with retro seduction and yet takes us into the distant future. By cupping the female form in all of its beautiful shapes and lines. Extensive collections continually impress with spontaneous creation of new feels, exquisite formations of style, and looks to put red blooded woman fans on their knees, possibly even for life. Roland has a unique method of creativity, and this is perhaps what produces the fresh and delicious designs. He literally makes them in 3D, rather than choosing the pen and paper approach, Roland Mouret prefers to take his models and drape the fabrics over them until he sees that perfect line, he stops there and cuts. This is an instinctual process, and one that is personalised to him. In this way, everything that is produced is personal and yet holds a universal element of charm. “This is the paradox” claims the Parisian, and I believe he is right. The worlds of fashionable art and technology are colliding this May at the Metropolitan Museum of Art, New York. Manus x Machina is the new exhibition to woo spectators and observationists alike when the demonstration of these two ever changing concepts of society is presented. Hand held by the Costume Exhibit wing's Spring theme, crafted and maintained by the Robert Leyman wing of the Met, over one hundred years worth of fashion and technology will be on show in the form of more than 150 individual pieces. Each one will be there to be cross examined, explained and highlighted for its particular historical and cultural value. The Metropolitan Museum of Art, New York, is an institution for the preserving and promotion of fine art, modern art, and the nurturing of young artists in America. They hold regular groups and sessions which are aimed at providing expert insight into the particulars of this fascinating universe of self expression and critique. As a whole, the museum can boast a proud collection of over 5000 years worth of human art, from all over the planet. Gifted, donated, acquired, discovered, it all resides within the walls of this glamorous establishment, a destination for art lovers and for children, curious people and those who want to impress on a date. Do a bit of reading up before hand to really get the test tube fizzing, that's if there is a reaction to be had, art I good but it's not a genie in a bottle! And even then, if my memory serves me, Aladdin had trouble with that one too. Listening to early demos of famous bands is a fantastic way of discovering how they sounded without all the grooming of commercial agencies. When we hear the early work, before the expensive studio and conceptual art, we get to hear that raw ingredients which attracted the fans in the first place. It's good to know that when unpolished, the bands of our dreams sound just like regular people playing instruments. Even more so, when we go back a few years and listen to work which would no doubt have been made using simple tape decks and possible DIY recording booths, popular with single or duet artists., we discover that their delivery is crisp, on time, and yet raw and still carrying that back room feel that just disappears as soon as someone gets signed. Further on from this, we can then listen to their first professional release, and compare the two sounds. We can listen for that element which the record company decided to keep, and the element they decided to drop. Sometimes the difference in sound is profound, and other times, not so much. Always though, something in the original sound is grabbed and amplified until it forms a unique twist that the marketing people hope, will become associated with the brand of that particular group. The band brand. Youtube is a perfect resource for music research. Although not with the same quality we get from CD, the basic quality is good enough for a simple listen over and most of the factors are still there. In fact, only in studio quality recordings, do we tend to find there to be a recognisable difference at all in digital compression. As the nature of Youtube is to deliver video, and album usually consists of an image alone, the entire bandwidth is reserved for sound, meaning there is no compromise apart from in original compression. It is possible that if the album is accompanied by moving images, that the sound is further reduced in quality to make room for this. When listening to rare and difficult to find music such as demo versions, Youtube is almost as good as the real thing. The hard copies are out there and yet contain so much material value which increases all the time and so listening to those directly is not advisable anyway. Some bands offer special represses of early work, especially to fan club members. These nearly always come with a heavy price tag, on top of the membership fee, and the money spent on the regular merchandise, listening for free doesn't feel so bad. Here's some demo albums from famous bands. As I mentioned in my book, “Doctor Universe”, the universe does indeed speak to us in sensations and feelings, the messages we receive from the cosmos come to us via nature, our observation of it, and then finally the application of personal circumstance into the meaning of it - for the individual. Let's look at the word individual, it contains the words “in divide” or not divided, “dual” two. So an individual is an undivided materialisation of two concepts, material and spirit or conscious awareness. The word also contains the word “id” which although coined later, is relevant as the id is a part of the psyche described by Sigmund Freud. The individual experience is created by the fusion of a material and a conscious experience, in the mind of the perceiver. With both universes present at the same time, the singularity of being experiences a particular thread of reality based on the product of both ingredients. These ingredients are subject to various rules and laws governed by nature. Although nature is incredibly diverse and seemingly random, after the application of scientific principles of learning, we can discover basic rules which appear to always be obeyed. The rules of nature in the material universe are described by science. We test the universe and describe what happens. After several experiments it can be shown that particular trends begin to appear. These trends can be used to accurately predict behaviour for future experiments. Once something appears to have been proven, it can then go on to be applied in society by people who gain an understanding of its principles. When applying the scientific method to the inner universe of the conscious awareness, the doctrine is often labelled as the occult or metaphysics. This unprovable study is conducted in the laboratory of the awareness, in which the experience of the practitioner is the result. Again, with specific study, mystics and metaphysicians have been able to accurately document the inner working of their own universe and then again with the collection of observations, their work has correlated with others to create universal principles which can be applied to all people. Once more, society has utilized these factors of life where people have gained understanding of them. One particular industry which often uses this is media, music and advertising being two of the most obvious candidates. Art is a direct representation of the fusion of these two seats of existence, by outputting a feeling felt into a material thing, we once again create from the two sources, producing something unique. This is then witnessed by others, and as Doctor Universe for those who have already read it states, we receive messages about ourselves from the experience of witnessing art. It is not as vocal as nature, it does not have as much scope for depth and yet with the human hand of creation, an all new human element is given and that allows us to find things nature on its own just cannot do. Our natural skill for ration and logic allows us to portion natural expressions into things that form patterns and linear stories of feeling, and this is something that perhaps is what nature lacks, for in the principle of nature as a work of art, it more resembles those ancient laws of metaphysics that have been outdated by the precision of dry material science.